So it is not so much the Cloud itself, as the way it can be used that is a game changer for business now. It is not simply a way of hosting services on a third party platform. It represents a new way to access and use IT services and data. Many companies use specialised Cloud based Enterprise Resource Planning (ERP) systems, to give them the tools they need to manage their business. A good package will allow them to access their data quickly and accurately, and make informed decisions about all aspects of the business in real time. Enterprise Resource planning (ERP) is using business process management software that will enable a company to utilise a suite of integrated applications to manage the business. It will automate some back office activities and tasks such as Human Resources and Payroll. The objective of using an ERP planning system is to provide one central archive for all information used by the different modules. This is used to improve the flow of information across the business. It is possible to use mobile ERP to give management real-time access to information, wherever they are. They can read reports, use dashboards and conduct key business processes on the move. Each ERP software module focuses on one specific area of business, such as product development or marketing. Some commonly used ERP modules are those for product planning, purchasing of materials, inventory control, distribution, accounting, marketing, finance and HR. There are also modules available for distribution process management, and supply chain management. Software modules can be used to improve the accuracy of financial data, or to enable better project planning, standardize critical business processes, and even to reduce redundant tasks. A good Software Vendor or Managed Services Provider will assist the management of their client company to select a suite of Enterprise Software Modules that effectively meets the specific needs of the business and delivers a preconfigured Cloud system with the technical capabilities the business needs. Together they leverage cutting edge technology through significant and sustained investment in the IT system. The opportunity is available across the entire spectrum of businesses for companies to exploit faster flexible access, easy expansion, and benefits to their bottom line. Currently this type of system is mainly used by medium and larger companies as they may be outside the reach and budget of smaller businesses. Allowing all your devices access to the same data is a basic principle of Cloud computing, even though you may access the file locally. Microsoft’s Office Online is a suite of Webapps. They are online only versions of Word and Excel, PowerPoint and OneNote. They are accessed using a Web browser, but don’t require the user to install anything because they are Web-based cloud applications. Google Drive is a Cloud computing service, which uses online storage, and works with Google Docs, Google Slides and Google Sheets, which themselves are Cloud apps. Apple iCloud service offers online storage and backup of the user’s mail, contacts and calendar. It also synchronizes them. Amazon Cloud Drive offers storage for digital purchases from Amazon, and it is integrated into all its products and services. It is used mostly for music, usually MP3s purchased from Amazon. You can also store images, and Kindle related purchases. 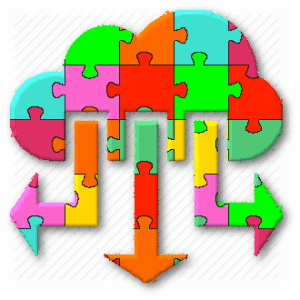 There are hybrid services such as Dropbox, and SugarSync. They do use the Cloud, and store a synchronised version of files online, but many also synchronise files with local storage. Another example of cloud computing is a group of people using separate devices to access the same synchronised data.